A great collection of bluegrass standards for Piano/Voca/Guitar. Over 70 songs and 224 pages in a all. A comprehensive collection of 90 bluegrass songs, including: Arkansas Traveler, Beautiful Brown Eyes, Corrina, Corrina, Dixie, Foggy Mountain Top, John Henry, Liza Jane, Mule Skinner Blues, Rocky Top, Sally Goodin, Turkey in the Straw and many more. Includes notes, words and chords. 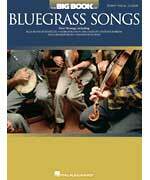 Bluegrass Favorites - Words and chords to over 100 of the top bluegrass songs. Chord charts for guitar, banjo and mandolin. Instructions include a way of putting a banjo and mandolin in pitch with a guitar. All The songs are different from the original Bluegrass Favorites. Number 2 also has chord charts for guitar, banjo and mandolin. Instructions include a way of putting a banjo and mandolin in pitch with a guitar.